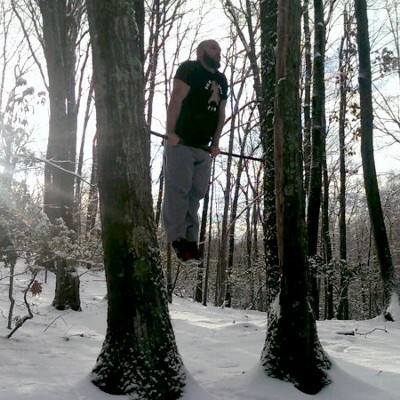 In previous articles, I have discussed several facets of outdoor training in the winter. I have not only highlighted the potential of outdoor exercise, but I’ve also emphasized the significance of dressing appropriately. Extreme temperatures are nothing to take lightly. It is always important to prepare yourself for the elements around you. Considering that advice, I was not surprised to see some questions after I shared the following pictures to Instagram. Many people asked if I had a change of heart in regards to winter attire. The reality however is that I still believe it is important to protect and prepare yourself for the elements around you. Over time, I have simply conditioned myself to handle temperatures that may have been too cold for me previously. As a result, there are times when I go outside in a t-shirt or even barefooted as seen above. I don’t stay outside too long, but I am able to perform some exercise without succumbing to the elements. A natural follow up would be to ask what’s the point of conditioning yourself for colder temperatures. Personally, my initial reasons were unique to my situation. During the winter months, my gym becomes quite cold. The temperatures inside the gym are typically lower than outside. Once it gets cold, it stays cold throughout the season. In previous years, I brought in small heaters to help warm the gym. Heat isn’t cheap though. It gets costly to warm a frigid garage gym. As a result, I eventually decided that I would train without heat. It has now been a few years since I used any heat for myself when training. Early on, I needed much more time to prepare for the cold. Gradually, I was able to improve my tolerance. Now, I am able to train in the frigid winter months without any problems. It isn’t an issue, where in previous years, I couldn’t wait for the summer. Another reason that I conditioned myself for the cold was to challenge myself mentally. I am always looking for new ways to test mental toughness. Conditioning yourself to perform in extreme temperatures all but guarantees a mental battle. At some point, you will be forced to operate outside of your comfort zone. Training in the cold has improved my ability get comfortable being uncomfortable. A great video that touches upon this topic can be seen below. Former Olympian Cary Kolat shares a story about a Mongolian wrestler that he encountered during his first trip to the world championships. There will undoubtedly be readers who question my sanity after reading this entry. Before anyone comments, let me start by saying that I am not urging anyone to train in the cold. It is not necessary for most people to condition themselves for extreme temperatures. It is also worth noting that there are certain environments that can be potentially deadly if you are not dressed appropriately. Extreme heat or cold should never be taken lightly. I am only writing this entry to share what has worked for me. My decision to train in the cold began as a money savings idea to reduce my heating bill. To my surprise, I was able to condition myself for colder temperatures than I would have ever imagined. I am quite pleased with the results as my outdoor sessions continue to improve from year to year. I recommend neoprene socks and trail shoes. Light, good “grip”, and if you get wet it’ll only last a few seconds. As I mentioned previously check out a guy called Wim Hof. His nickname is the ‘Iceman’ and his examples defintely support the idea of building mental toughness. When physically exercising we progressively overload our muscles in order to grow stronger. The same principle applies to the mind. Adapting to the circumstances of our life/environment is what we are born to do. Keep up the good work Ross’s, and keep these articles coming… They are great food for thought and very inspirational. according to the Iceman, proper training with cold has a huge impact on the cardiovascular system. if you do that consistently, the muscle lining of the blood vessels become a lot stronger and relieve the heart of part of his work by contracting and relaxing powerfully as I just explained. It is like weigth training for the muscles, the veins become more efficient. WIM HOF says you can lower your pulse as much as 25 beats a mn !!! even if one can achieve only 10 it is still extraordinary and worth trying. What do you think ? Most of us NEVER get a chance to trigger this bodily response, because we ALWAYS keep warm. As far as I am concerned I have began this kind of training (barefoot jogging/walking in the snow, ice bath and cold shower, and you know what it is EXHILARATING !!! I love this post in particular. If you live in even a moderately cold climate, make sure you can thrive in it. I grew up on a dairy farm and was obligated to be out at 6 a.m. regardless to work on the weekends and when I could during the week. I watched my dad smash himself daily, heat and snow) and while I was never impressed (or admitted to it) when I was an idiot teen, it has molded my thoughts on toughness and work ethic as an adult. For 12 years I have commuted by bicycle (and trained when I was training for cycling) 365 days a year. -20, -30 (Celsius, I’m Canadian) isn’t out of line and while the first couple days are tough, once you get into it nothing really phases you. I have no choice (well, I guess I could bus but, forget that) so you do what needs to be done. And I’m not going to pretend I’m tough. I’m not a fighter, I don’t train in that manner but I do feel that there are minimums in life and one of those minimums is being able to do what is needed on a daily basis in the environment you live in. If life comes to a halt when winter comes or the heat of the summer hits … figure out what you need to do to adapt to it. Anyways, long rant, sorry about that. Love your work and your ability to be positive and motivational. HI ROSS, ANOTHER INSPIRING POST. LIFE OFFERS NO GUARANTEES. ADAPTABILITY IS THE NAME OF THE GAME. TRAIN SO YOU CAN BE READY FOR WHAT LIFE THROWS AT YOU. MOST OF MY LIFE CIRCUMSTANCES HAVE MADE IT NECESSARY TO BE ABLE TO ADAPT TO DIFFERENT LIVING AND TRAINING ENVIRONMENTS MOST OF WHICH WERE NOT COMFORTABLE. BY HAVING MY COMFORT LEVEL STRETCHED THIS WAY I FEEL PRETTY COMFORTABLE WHERE EVER I AM NOW.VERY INTERESTING TO READ ABOUT THE EFFECT TRAINING IN THE COLD HAS ON THE CV SYSTEM, AND YES IT CERTAINLY IS EXHILARATING. ONE OF MY OLD TRAINERS USED TO WEAR A SHORT SLEEVED SHIRT IN SUMMER AND ONLY ADD A SWEATER IN WINTER. HE NEVER HAD A COLD OR DAY OFF WORK ALL HIS LIFE AND WENT TO SLEEP A 84 PEACEFUL AND QUIETLY. As always a terrific post from Ross. I have to comment regarding Wim Hof though. He is not an example of someone who has become conditioned and “mentally tough”. Wim Hof uses specific exercises relating to ancient Tantric practices. Rather than conditioning himself through progressive exposure and developing tolerance, he is using very specific meditative and breathing practices. He is affecting his autonomic nervous system in a way that is out of the reach of the average person, and survives the cold by literally raising his internal temperature. His practices would be referred to as “siddhis” in spiritual terms, but there are scientific studies proving the unusual control over aspects of bodily function that he can demonstrate. I’m not saying what Wim Hof does is magical or significantly greater than what Ross is proposing, I’m simply saying they are very different. They are both excellent examples of ‘mind over matter’ and self control, but they represent different paths. More power to you Ross. But doing any barefoot work in the snow isn’t my idea of a good time. If that was something I was into then I would join the group that jumps into ice cold waters. However, while heat isn’t cheap I found it’s not necessary either: for working out that is. I workout in my garage 99% of the time. With me living in CT as well I workout in the garage, no heat, door open, but due to the seasons I throw on my winter hat, thin gloves I got from Home Depot, and start with an interval of jump roping. Then I go into my strength. Works for me. Fantastic post Ross. Similar findings here. @ Tom a couple of posts up. Re Wim Hof thats not entirely accurate. Its clear, from the book him and his student Justin Rosales authored, that all these factors come into play. -Breath holds -> Which affect the autonomic nervous system and train the connective tissues via pressure. -Progressive exposure -> You start with taking baths in tubs of cold water for progressively longer period of time etc. Apologies if my comments were unclear. By, “rather than conditioning himself through progressive exposure and developing tolerance”, I simply meant that the progressive exposure is not what allows him to maintain an internal temperature, it is simply an aspect of his process of climate tolerance. Progression is invariably an important aspect of skill development. Maintaining focus and performing a skill in an extreme environment is obviously very different to performing the skill in a pleasant environment. So progressive exposure is important to learn how to adapt and maintain that focus in increasingly challenging environments. I would suggest that what you do with that focus is where the divergence occurs. 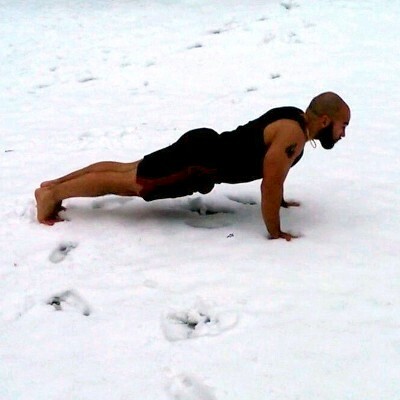 An athlete would use that focus to conduct exercise, where as Wim Hof would use that focus to conduct his practice, allowing him to regulate his internal temperature and so on. That is what I meant by them being similar but ultimately different. Conditioning your body using your mind versus conditioning your mind with your body. Over the years I’ve been fortunate to meet and work with veterans from the Falklands conflict 1982. Ex Royal Marines and Paras told their tales and shared their experiences; all of them mentioned the cold, and the great distances they covered carrying 120lbs of kit on their backs. At first the cold was a major problem, some of the guys with the lower body fat percentages really suffered, but after a while they adapted to the temperatures somewhat. Once the conflict was over and having spent a few weeks in these conditions they spoke of having to readapt on returning home to the UK – the cold had become the norm. Circumstances dictated play to a certain degree as the guys in the Falklands didn’t have the luxury of progressively conditioning themselves to the cold… However their bodies/minds did adapt to the conditions. The Parachute regiments moto is ‘Utrinque Paratus’ and means ‘Ready for Anything’ – this is an attitude of mind, part of their mental makeup. I guess this is what Ross speaks of when I read the article. you are a true boss, ross. Ross I have seen a few videos now where some men training in the cold rub themselves down with snow. I seen videos where this famous Wim Hof does it as well as some Mongolian wrestlers and Icelandic Strong-men. Do you know the reason why? To me it just seems like a good way to get ice burn or frost bite. Search “cold water therapy snow” and you’ll some related info. It’s a process just like anything else (not something that you adapt to overnight).